PowerRush™ ADVANCED TECHNOLOGY delivers 40% more starting capacity allowing you to do more with less. 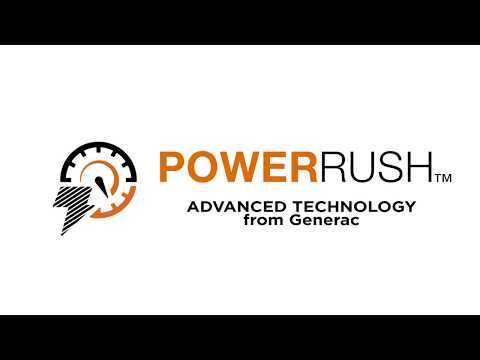 Learn more about PowerRush™ Advanced Technology. Rated 5 out of 5 by Roger from Good value for the money This is my first generator purchase and I think I made the right decision too. I think that the quality for the price is very good. Starts up easy and runs for long time with no issues at all just a little noisy but it’s a performer. Good job Generac. Rated 5 out of 5 by LdwSaw from Easy setup. Easy to setup. Haven't needed to use yet. Easy to move from one place to next. Bought it because of uncertain weather right now going into spring and water table high. Have a sump pump that needs to continue to run to keep basement dry. Reading other reviews, we believe the Generac generator will perform very well when needed. Rated 5 out of 5 by Craig from Very satisfied I bought this generator during a recent power outage to back up my home. It performed amazing for its size. Ran a gas furnace blower, 2 Tv's, x-box, washer and gas dryer, lights, fridge and coffeemaker. Without any trouble at ALL!!! Ran it for 44.8 hours on 8 gallons of fuel. Rated 3 out of 5 by Bigeasy from Very Loud and very heavy It really struggled to run 2 1500 Watt heaters and a lamp. Tried to put a smaller 750 Watt heater with it and it kicked the fuse.. Rated 5 out of 5 by aeguy010 from Great Quality, trusted name Have been holding out for a while on purchasing a generator. With the impending wind/snow/rain storm hitting Ohio I decided now was a good time! 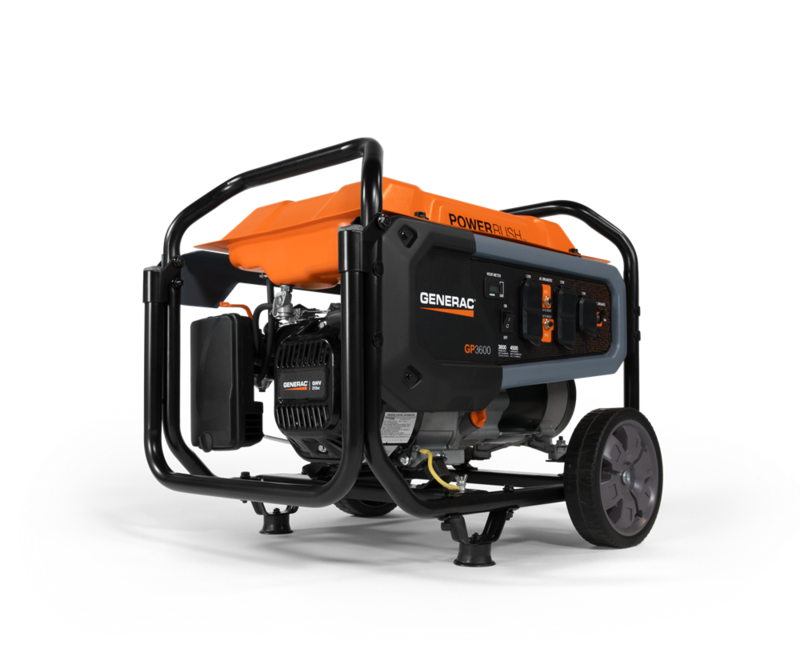 I had a choice between the predator line that was a lot of generator for the price, Champion that is a very good value, or Generac that is a trusted industry leading company. I liked the fact the entire machine is designed and produced by Generac, The engine is made to handle the rigors of constant running for long hours. The 3 Year warranty tells me that Generac is confident in their product. Also, having the ability to get parts and service was the deciding factor for me. You get what you pay for. Assembly was easy, took 20 min. I had it running and saving my basement from flooding. Would recommend, and will seriously consider for my next purchase in the future. Rated 5 out of 5 by DM from Did what I purchased it to do Purchased to power fans, refrigerator, freezer and power tools during hurricane Michael. Ran all day every day for 8 days and it performed perfectly. A little noisier than another generator we had on site, but overall performance was the most important thing. Rated 5 out of 5 by Kjag1957 from GP3600 I purchased this due to occasional outages in our area. This serves our needs very well and is very easy to operate and easy to move around. Running time before refueling of almost 10 hours is awesome. Absolutely a great piece of equipment for the home. GP3600 49 ST is rated 4.8 out of 5 by 12.